Furukawa-cho, Hida C., Gifu Pref. Santera Mairi (lit. visit three temples) is a famous anual function in Furukawa and lasted for more than 200 years. people visit three temples (Enko-ji, Shinshuu-ji and Honko-ji) all the night through to the memory of him. to work for the filatures, returned their home town in January in their holidays. They dressed up and visited three temples or flowed down along the Seto River.. It was a good chance for men or their parents to find a girl friend or son's future wife. Since then, this event has been had special meaning of chance of meeting for young women and men. 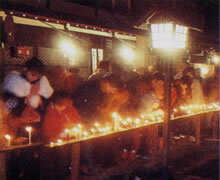 There are approximetery 1.000 candles along the Seto River or a row of old houses along the street. You also find 40 to 50 special candles which are 2m (6.6ft) in height, 1m (3.3ft) in diameter and 500kg (1.100lb) in weight made of snow.